Supplies, Equipment and Meds – Odyssey Medical Inc.
Odyssey has been in the supplies business since 2006. As a company that provides medical services at special events, we carry a variety of items in our bags, bins, and kits. From basic first aid supplies such as bandages, antiseptic towelettes, gauze, and tape to more specialized supplies such as IV catheters, endotracheal tubes, and suturing materials. We find that many items we carry year-round are the very same items you are also stocking in your kits. Have you ever noticed that when you need to replace one or two of your IV angiocaths the only option out there is to purchase a whole box…in each size you need! We also experience this and have come up with a unique system where we order in the supplies we need to stock our event kits and then offer any ‘extra’ items for individual sale. We have had lots of positive feedback that being able to buy just the right amount of stuff when its needed saves money and reduces the amount of items that get tossed out due to expiry dates running out. It takes a lot of different pieces of equipment to cover over 1000+ event days each year. Minor Wound/First Aid kits – most of what we do is taking care of minor injuries or illnesses. Basic Life Support kits – for those injury or illness calls that need just a little bit more supportive care. These kits have diagnostic equipment for taking blood pressures, blood sugar levels, as well as oxygen and airway management. Advanced Life Support kits – bring even more supplies for our health care team when someone needs specialty medications or tools. and so much more… ask us! One of our most challenging supplies to manage is our medications. Planning enough medications to cover an event that may be in a rural location, may run over a weekend with little to no pharmacy access, and/or may involve extreme environmental conditions (either too hot or too cold) takes a lot of thought. Many medications are quite expensive and have short expiry dates. Another thing to consider is which medications will you carry? Every healthcare provider has a different preference on which medication they like to use. How many medications, that do nearly the same thing, will you supply for your team? In all of our communities, every year, there are a multitude of small and medium sized events. 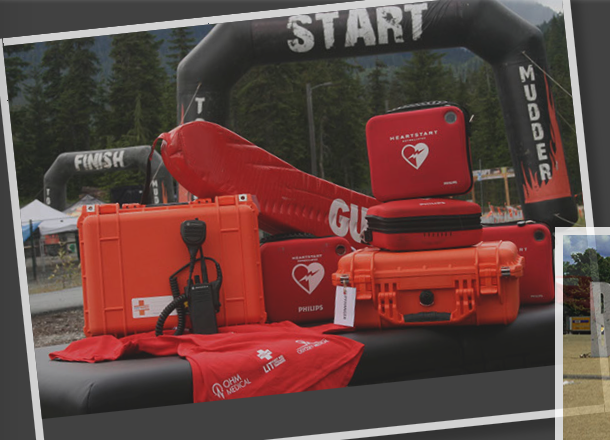 Very few individuals or groups have access to the full range of equipment and supplies needed to offer first aid or more comprehensive health services at these events. We have created the concept of a “community quilt,” a patchwork of shared resources and expertise that is accessible to the teams and individuals running/staffing small to medium-sized events.